THE ULTIMATE CARB SET FOR ALL MODEL POCKETS. LARGE 16.5 BORE FOR TOTAL PERFORMANCE. 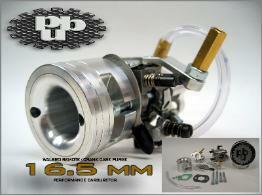 ASSEMBLY, BRASS THROTTLE BARREL, CLEAR PURGE LINE.